Japan is the land of mouthwatering sushi, sashimi, dessert and many more! You name it and the Japanese will put their heart and soul in it. I went to Japan in June with my family and had the best foodie experience of all time! Here's 17 must-eat dishes and snacks in Osaka and Kyoto you must not miss out on! If you know me well enough, you'd know that I'm a huge fan of dumplings. The moment my family and I landed we headed straight for some food at the Dining Court in the airport. The first stall I stumbled upon was 551 Horai, a well known stall in the state for their dumplings. They have branches around the state as well. The dumplings are steamed and pan friend upon ordering so you get this box full of sizzling hot dumplings that makes your mouth water. The skin was not too thick nor too thin, the filling was generous and it had a bit of crunch to it as well. Chicken skin has been known to be fattening, oily but so delicious. Although I love it, I know I might just suffer a stroke from it one day. Hence, you gotta trust me when I say this fried chicken skin is worth an admission to the hospital. It's so crispy and the seasoning on it comes together so well with the fried chicken skin that I couldn't help but order more than twice. Give in to your sweet tooth here at Mother Moon Cafe in Tempozan located near the aquarium. The Cremia Soft Cream has a velvet and creamy texture to it that I couldn't resist falling in love with. Not to mention, the cone was this light butter biscuit that went perfectly well with it. The next thing you have got to try is the Caramel Roll Cake. The texture is so spongy and soft that it melts in your mouth within a few bites. It goes perfectly well with the caramel and cream, literally a perfect harmony in your mouth. If you're a fan of shell food like me, especially lobsters, you ought to try this! Fresh lobster meat on a bun and you can have it on-the-go. I was so obsessed with the idea of it to the point that when I had it, I was falling head over heels in love with it. The lobster was so fresh, juicy, cooked just right and well seasoned. The bun was just an ordinary hot dog bun but thanks to the lobster it upgraded the dish overall. Osaka is literally the land of Takoyaki. If you visit and don't at least have Takoyaki once during your trip, what are you really doing in Osaka? This Takoyaki is famous among the locals and tourists. Located in the heart of Dotonbori, you wouldn't be able to miss it with its big octopus signboard. The Takoyaki was cooked just right, not too overcooked and hard and not too undercooked and watery. 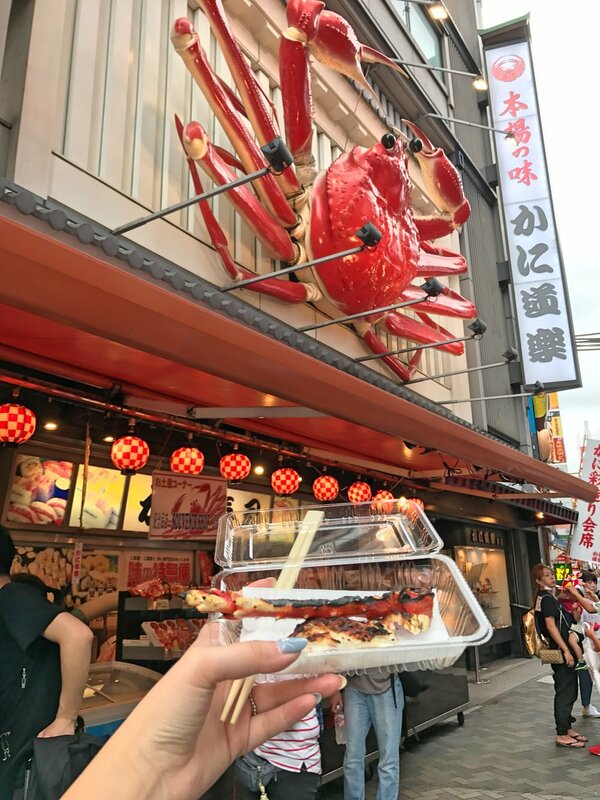 Within the shop lot also consists of a Takoyaki museum so if you love this dish enough to want to know the history, this is where you ought to visit. The highlight of Dotonbori is the huge crab signboard. You can literally google Dotonbori and find a bunch of images with this huge crab in it. Kani Doraku is Dotonbori's most famous restaurant with the longest waiting list you could ever possibly imagine. My family and I tried to go in for dinner at 7pm but the waiting list was 4 hours long. Honey, I'm not about to starve till 11pm for dinner. Hence, the next best thing was this little stall outside the restaurant they set up for people who can't wait or afford a meal in there. Grilled crab legs for takeaway with no seasoning needed, the taste came from the fresh crab itself. Only downside was the meat was kinda little for the price we paid, guess that's what fame does to brands? If you're an otaku, you'd know that Animes usually feature high school girls and their Melon Pan for break time. If you've ever wanted to try it because of an Anime, you're not the only one. I stumbled upon this green truck that's apparently really famous for their freshly baked Melon Pan topped with ice-cream. I literally lined for this in the rain because I was so determined to try it. My effort has not gone to waste, the bun was still warm and soft upon ordering. It had a subtle sweetness to it and it went so well with the green tea ice-cream I chose. It was the perfect dessert on-the-go! Gudetama the sad and lazy egg who's pretty much done with life as an egg is my spirit animal. The creators of Gudetama, Sanrio created a cafe dedicated to this cutie. The cafe serves local and fusion dishes with Gudetama as the main attraction. The curry was good, very well seasoned and spiced. Aside from that, my other favourites were the Beef Don because you can't go wrong with rice topped with beef and egg. To end my meal, one of the best desserts I had on the trip was this Green Tea Tiramisu. It was so creamy and refreshing, I couldn't stop myself. The roll cake here in Arinco is done differently. For people who want to eat their roll cake on-the-go, they serve it in the most unusual way that allows customers to enjoy it fuss free. The sponge cake comes in a rectangular shape and is topped with fresh cream, imagine a traditional roll cake but deconstructed. Aside from that, they also have the traditional roll cake which is highly raved about. The roll cakes here have been one of the best I've ever tasted. The sponge and cream is so light you could never get sick of it. Warabimochi is a unique kind of Mochi that's different from the traditional kind. It is made from a special type of flour that makes it very light. It is served topped with green tea powder or kinako (soy bean) powder. I had this while walking up to the temple and another one down the temple. It was so refreshing as well because the Warabimochi had such a water-jelly like consistency to it. This cream puff was mind-blowing. They serve you freshly baked hot puff filled with either the original cream filling or the green tea one depending on your selection. The best part of the puff is not just the fact that it's freshly baked, it's also the fact that it's cinnamon based. The fragrance of the cinnamon paired with the cream and pastry did a little dance in my mouth before I swallowed. The Minions Pizza is only served in USJ. I think I was most fascinated by how the pizza was topped with corn and questioned if it would taste good as a whole. The Minions definitely proved to me that corn on pizza is a wonderful pairing. It didn't taste odd, it even gave a good crunch to it while having the pizza. Imagine devouring this cutie! Well worth it tho, sorry not sorry. The Hello Kitty steamed bun had minced pork filling in it. The meat was juicy and well marinated. It leaned more towards a traditional Chinese meat bun more than anything else and who doesn't love a good steamed bun? If you're a fan of churros, this is one unique one you ought to try! This Minion themed churro has a chocolate base and is topped with banana sprinkles and icing. The churros were kinda hard but still chewy enough to get a churro-kick. The banana icing and sprinkles also went well with the chocolate. Unleash the hungry monster in you with this XL Turkey Leg only available in USJ! I swear the gluten in me came out and devoured it. It was so juicy and tender, the flavour was just bursting in my mouth. My brother and I were literally fighting like cave men for this drumstick. If you're a Harry Potter fan I'm sure you know what a Butter Beer is and have always been wanting to try it! The Butter Beer is exclusive to USJ and its Harry Potter theme parks only. The Butter Beer was creamy and sweet, it had an odd texture for a drink but it wasn't bad or anything. Since I wasn't a fan of carbonated drinks, one was enough to just check it off my to-do list. The instant noodle museum is where you get an eye opening experience of how cup noodles were made and how many cup noodles Japan has actually produced over the years. From the different flavours to the different packaging, it was amazing! In the museum, tourists were also allowed to DIY your own instant noodle. By doing-it-yourself, you get to pick the soup base, the toppings and also design your own cup with markers! A fun filled experience that you don't want to miss.